This is the second of three articles analyzing the recent Wisconsin Supreme Court decision in Steinmann v. Steinmann, No. 2005AP1588. This article will examine its implications for marital property agreements. The agreement stated that it was binding in the event of a divorce, and the Walworth County Circuit Court, Judge Michael S. Gibbs presiding, in a pretrial hearing, found the agreement to be valid and enforceable for property division purposes. Before and during the marriage, Rose and Tony purchased a residence and other properties. All were titled jointly. At trial, the court ruled that individual property covered by the agreement remained the sole property of that individual. However, the court divided the marital property equally, including all of the jointly-titled real estate, finding that these properties were no longer individual as defined by the agreement. The circuit court rejected Rose’s argument that the court should apply tracing principles to designate these jointly-titled assets as her individual property, ruling that the joint titles rendered them marital property. Rose challenged the circuit court’s property division, arguing primarily that the court improperly applied transmutation rather than tracing principles. In an unpublished decision, the Court of Appeals affirmed the circuit court, holding that the court did not err in its determination of division of property. The Court of Appeals rejected Rose’s tracing arguments, holding that titling the properties in joint name indicated donative intent and transformed the property from individual to marital property. The court went on to hold that tracing and transmutation principles may be applied to cases that do not involve gifted or inherited property, although the result of applying transmutation principles in this case is “less transformative” than it would be in gifted and inherited property cases. The Supreme Court did not provide any guidance as to how much “less transformative” the principles will be for marital agreement cases. The court further held, also not very helpfully, that “… this case involves transmutation by gift, rendering tracing less relevant than if the case did not involve such evidence of donative intent.” Again, no guidance was provided as to how much less relevant. For one, pre- and post-nuptial agreements are becoming increasingly popular. Many times, however, it seems that estate planners are drafting agreements that contemplate divorce. At the risk of stating the obvious, wouldn’t it make more sense for divorce lawyers to be drafting agreements that mirror the parties’ intentions in the case of divorce? Or, perhaps the better practice for couples is to have two separate agreements, one for estate planning and one for divorce planning. Second, any attorney drafting marital agreements in Wisconsin needs to be conversant in both Chapter 766 and Chapter 767 principles. For reasons that escape rational explanation, the marital property classification under Chapter 766 does not apply to property division under the family code in Chapter 767, which utilizes equitable distribution rules. Kuhlman v. Kuhlman, 146 Wis. 2d 588, 432 N.W.2d 295 (1988). While in many cases, the difference between marital property and equitable distribution makes no difference, where it does matter — for example, in drafting marital agreements — the lawyer needs to know both systems. Third, parties entering into marital agreements need to know that their acts after signing the agreement in titling property and exchanging assets may have a significant impact in the event of an eventual divorce. Look for more on pre-and post-nuptial marital agreements in a future article. In the meantime, next week, we’ll look at Steinmann’s maintenance ruling and its implications. Let’s just say that, if the property division portions of the decision have left family lawyers scratching their heads in confusion, the maintenance part does that, too — and some of it even merits withdrawal. 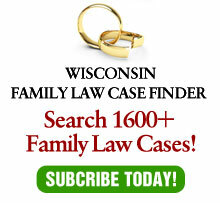 The article originally appeared in Wisconsin Law Journal.